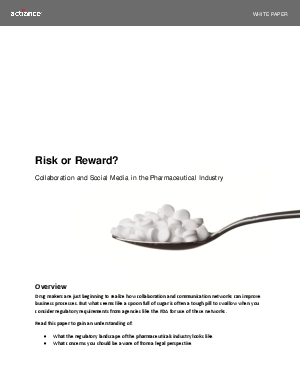 But what seems like a spoon full of sugar is often a tough pill to swallow when you consider regulatory requirements from agencies like the FDA for use of these networks. Adopting new technologies that allow employees to share information and exchange ideas with each other and with your customers is often the best way to achieve better business results, but doing so can involve considerable risk. That’s because the content people create using these technologies is subject to the scrutiny of regulators, legislators, and litigators. On top of that, increasing litigation has made it a business requirement to consider solutions that help bring down skyrocketing legal costs. Pharmaceuticals companies must be knowledgeable of, and abide by, specific information retention regulations in every country where they do business, including those countries that prohibit data from leaving the countries’ borders. Not having technology in place to help manage these requirements and increasing risks, or doing so without careful planning, can be a costly mistake.